Body butter is awesome in any form. It is so rich and luxurious that you just can’t help but love it. 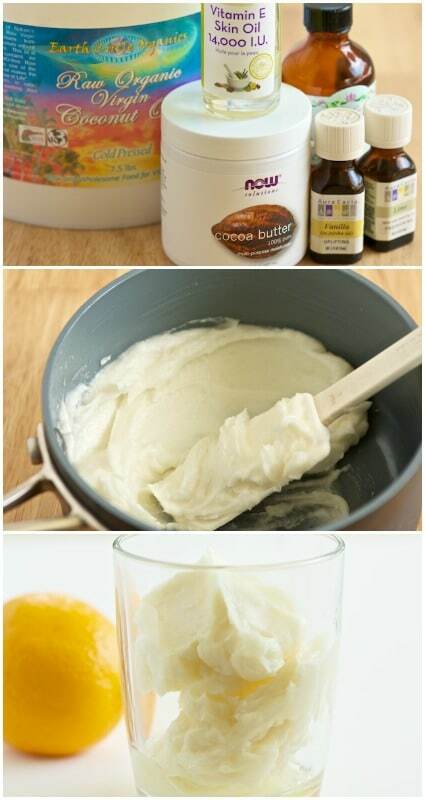 We found an awesome lemon cream body butter recipe over at GI 365 that you are simply going to love. The recipe is great for dry or scaly skin and with summer coming on, you are certainly going to need something that will keep your skin hydrated and soft. Body butter is excellent for giving you a luxurious moisturizing effect and this particular recipe does not contain beeswax so it dissolves into the skin really well, without that greasy feeling. You need about 6 tablespoons of coconut oil, 1 tablespoon of vitamin E oil, ¼ teaspoon of lemon essential oil and ¼ cup of cacao butter. This makes enough body butter for 2/3 cup, which is plenty for smoothing out those dry areas. If you love luxurious body butters, this one is a great one to try. The lemony smell is magnificent for summer and it is so easy to make that you may just want to make several batches and give them to your besties – or just keep them all for yourself; whatever works. Click on the link below to get the recipe and Kari’s instructions at gi365.